Have someone in your life that is impossible to shop for?! Well I have created a little “click-and-shop” gift guide! In each little slideshow, you can click the products to shop! And I’ve even broken down gift ideas based on who you are shopping for! Whether it’s your man, your mom or dad, or your best gal pal! Hope this helps!!! It’s fall now so my main job in wedding coordinating is slowing down for the “off” season, and I’ve been doing some styling for a boutique while trying to focus more on growing my blog! I’ve been reflecting a lot lately on how much my life has changed in the passed year and a half, and how it’s definitely changed for the better. When I first moved to Seattle, I had a different job in a totally different career field. And this year, in April, I celebrated the one year after officially quitting that job. Sounds a little silly to celebrate leaving a job when most people celebrate getting a job. Let me tell you something, in some ways, finally calling it quits can be even better for you than saying yes. Because in this situation, saying goodbye, meant saying hello to a happier life. So I will tell you some of the positive ways my life has changed since leaving that job. My style. It probably sounds goofy, but I’m a girly girl and I truly enjoy being creative with my wardrobe and my style. Leaving this job meant that I no longer had to feel ashamed about that. You read that right. Before I quit, I always felt like I wasn’t taken seriously just because I was a girly girl with my style. I would show up to work looking nice and people would think it was odd. No one should ever be made to feel uncomfortable for taking pride in how they present themselves. So yay to me for being free to rock cute outfits and have people actually appreciate them! Getting ready for work is fun! Now when I get ready for my day, I don’t feel like I have to amp myself up and put my armor on. I used to feel like I was getting ready for battle. You can imagine that hitting snooze wasn’t just because I wanted more sleep. It was because I was avoiding my job. Now I wake up energized, enjoy my coffee, check emails, and get excited for the possibilities of a new day. No more paranoia. Even when I wasn’t at work, I used to be paranoid all the time that I had done something the wrong way at work because I was being severely micromanaged. Let me tell you something. Micromanaging a person to make yourself feel more in control, is a horrible thing. If you ever want your employees to learn, feel empowered, and be happy with their work, put a little trust in them and if they’re getting the job done, it shouldn’t matter that they didn’t do it your way. Now I can actually enjoy my free time, because the people I work for/with, actually trust me. Because you know what, I’m a smart, capable woman. No one can make me feel differently anymore. Married life is so fun! My husband and I moved out of the city back in February, and we are living in the cutest village only a block away from a beach on Lake Washington. We are a five minute drive from Downtown Kirkland, which has tons of little restaurants and boutiques (my dream). And we are loving the slower pace of suburban life. Never thought I’d say that lol. Kids of our own are still in the future though. We still feel like kids ourselves! We are enjoying the present for now. We have taken some fun trips this year! We did Portland, Vegas, Coachella, New Orleans, Leavenworth for Oktoberfest, and we still have California next month for a wedding! We are truly at our best when we are traveling and exploring new places. Something I don’t think I’ve ever talked about is anxiety. I’m pretty positive that I have it. It’s something I’ve always struggled with and never really thought deeply about until this year. My new years resolution for this year was to work on having a healthy, worry-free mind. Mental health is a big deal and should always be taken seriously. I’ve noticed since I have changed careers that I am able to relax more, so that definitely helps. I’ve also created some of my own exercises for myself. When I am feeling anxious or worried (when everyone around me seems at ease), I think deeply about the situation and try to understand why I’m so worried. It helps me take a breath and a second look. I usually end up self-soothing and feeling much better. I also try to surround myself with the things that I love (candles, incense, my fave pandora station, Stevie Nicks Radio lol, I’m a hippy at heart). It’s not easy to talk about but I know that this is something that’s important to share. Especially if it can help someone who’s reading this. Life is not always as care-free and glamorous as it seems on social media lol. It’s fall. So naturally I’m obsessed with everything that’s going on. Fall is my favorite season and Halloween is my all time favorite holiday. Ever since I was a little kid, I loved dressing up for Halloween, decorating the house, and watching spooky movies. The fall fashion is also my fave because I LOVE being cozy. Give me all the big sweaters, cute boots, corduroy pants, and velvet anything and I’m one happy girl! You can always follow me on the Like.to.know.it app to shop my favorite fall items. I also cut my hair short! I took the plunge and I LOVE IT! It takes five minutes to style it and I feel like I’m channeling Kristin Cavallari (she’s my soul sister lol). Our dog Dez is as happy as ever. He lives the life of a royal basically. He’s pretty spoiled. Our families are wonderful and we are so fortunate to have so much love and support around us. We also have some pretty awesome friends, old and new. Finally, I’m so thankful that I have this kind of platform, to share my life and the things I love, as well as the things I’ve experienced. To whoever reads my blog, you’re awesome and thank YOU for being supportive simply by reading. Whoever you are and whatever you do, I hope you are HAPPY! And I hope you know I will always support you too! I’m always happy to meet new people and be someone you can talk to, so feel free to reach out to me anytime! Need a long weekend itinerary for the Big Easy?! 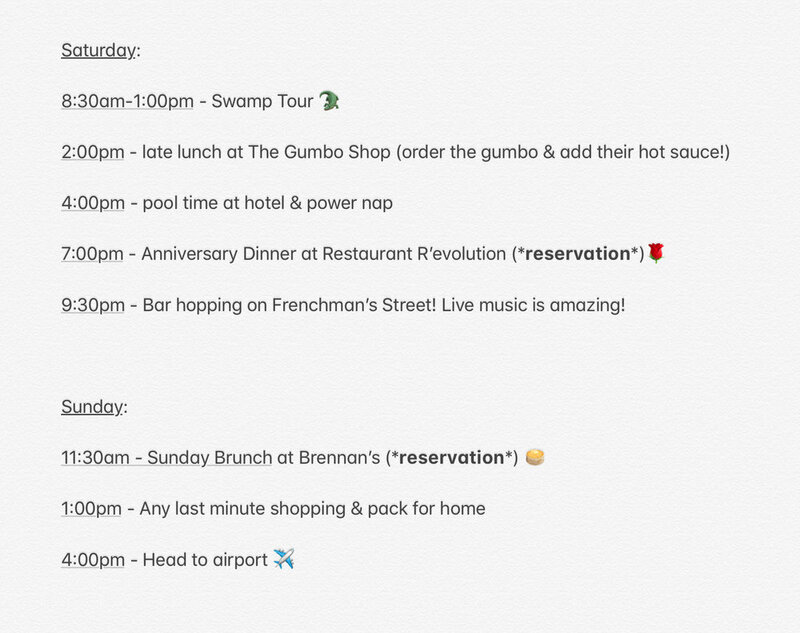 Here is our full itinerary from our One Year Anniversary Trip to NOLA! We absolutely LOVED everything we did! We said that next time we go, we have to go for at least a week because we are such foodies and there are still so many fun restaurants and bars we want to try! I hope this helps with your planning! Here are some photos from our trip! We had the pleasure of shooting with our wedding photographer recently, Patrick Nied, and I couldn’t help but share these! 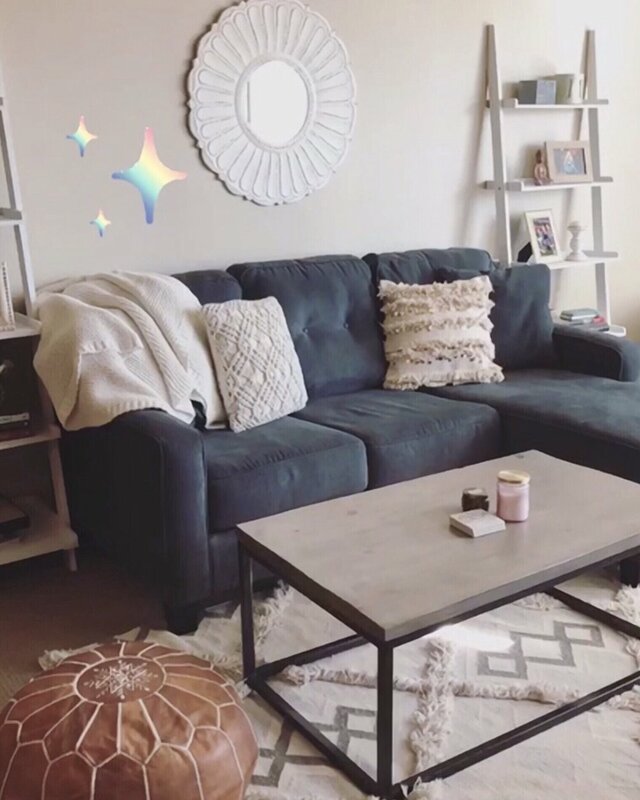 So we are all moved in to our new apartment by the beach and I wanted to share our updated home decor and share some of my favorite items so you guys can shop them easily! Some items aren't available anymore so I found some that are super similar! Click the photos below each room to shop my favorite items! Enjoy! Hi Guys! Here's the final city we visited in Thailand...PHUKET! We spent the last four nights of our honeymoon in Rawai in Phuket. Our hotel, The Vijitt Resort, was absolutely beautiful! We had our own villa to ourselves, with a private infinity pool, and golf carts to get to and from the bar/restaurant, lobby, and beach! We felt so spoiled! This was the most relaxing leg of the trip for sure! We loved laying around by the beach, and the water was sooo warm! Plus, you could walk out into the water so far and it would still be at our waists! So gorgeous! Look at the color of that water!! OMG so beautiful! One of the days we spent in Phuket, we did a day trip to the Phi Phi Islands! It was so amazing! We were picked up from our hotel early in the morning, served breakfast, given fresh towels and waterproof bags before being loaded into a huge speed boat! It took about an hour to get to the islands. First stop, Maya Bay! If you guys didn't already know, it was where the movie The Beach was filmed (with Leonardo DiCaprio!). We had the best tour guides. They even let us bring our own beer to share with everyone! Matt and I were definitely the favorites lol. From there we saw Monkey Beach, and then spent the afternoon on a nearby island having lunch and swimming! We also got to snorkel at an old viking cave! How cool is that?! Pina coladas on the beach! One final thing, we booked this entire trip using Tripmasters Travel online. It was a one stop shop for planning our honeymoon. We were able to book flights, hotels, private cars, and excursions in one place! I will always use them from now on for booking trips! Hope you enjoyed taking a peek at our Thailand honeymoon adventure! Martelli's Take Thailand: Chiang Mai! Here we go! Next city...CHIANG MAI! We spent the next four nights in the jungles of Chiang Mai! 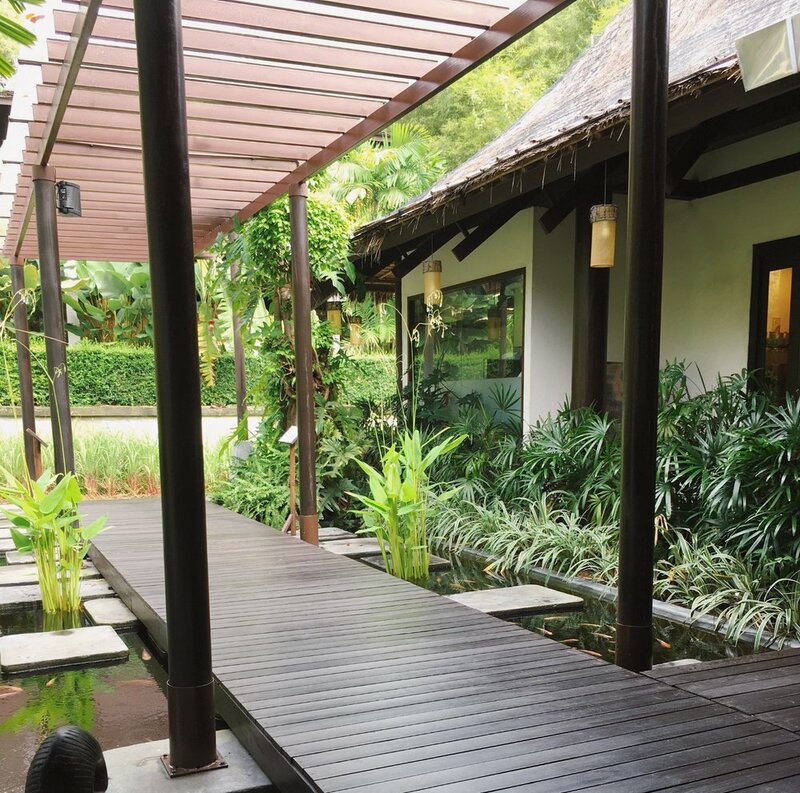 Our boutique hotel, the Shewe Wana Resort, was hidden in an adorable town, walking distance from the night bazaar! We spent our first night wandering around the bazaar, drinking pina coladas, sampling the street food, and I finally tried a fish spa (I'm so ticklish so Matt was laughing the whole time at my faces). We love to just wander aimlessly when we travel. We always end up running into the coolest places! We found beautiful temples in the old city, markets, and bars of course! We also found the most incredible noodle soup for less than an American dollar! WHAT!? And of course we enjoyed more tuk-tuk rides! We did so many fun things in Chiang Mai. It was definitely our favorite city of the trip. The vibe was so relaxing and laid back, yet we had plenty to do when we wanted to. We had an incredible dinner one night at David's Kitchen, hands down the most amazing service and the warmest welcome from the owner himself, David! And we even went to see a Thai boxing match with the locals! Definitely a cool experience. But I think the highlight of our visit to Chiang Mai, was visiting the elephant sanctuary. We spent the day feeding bananas to the elephants, giving them a mud bath, and then washing off with a swim in the river! It was truly a magical day with the most beautiful gentle giants. Elephant Sanctuary (make sure to pick a place where they DON'T ride the elephants, it's actually really bad for their backs). We can't wait to visit again! Love you so much, Chiang Mai! I wanted to tell you guys all about our honeymoon last August in Thailand! We went for two weeks and visited three amazing cities, all completely different from one another. Neither of us had ever been to Thailand, or anywhere in Asia for that matter. Thailand was so beautiful, so busy, so different, and is home to the kindest souls on this planet. Since there is so much to share with you guys about our adventurous trip, I'm breaking up these blog posts by city! We spent the first 3 nights of our honeymoon in Bangkok, and boy did we hit the ground running! Bangkok is the busiest city and the BIGGEST city I have ever seen in my life! When we first got to our beautiful hotel, the Avani Riverside Bangkok, we checked out the rooftop infinity pool and bar, and I kid you not, you cannot see where the city ends. It just keeps going and going. So when you visit, definitely have a game plan! There's so much to do! Pool time was at an all time high! Our view was incredible! Our hotel also had river boats to use to taxi across the river! It brought us to the sky train that brought us all over! We saw some more smaller temples, famous hotels, and the largest shopping center ever! Please comment with any questions or tips! Until next time Bangkok!